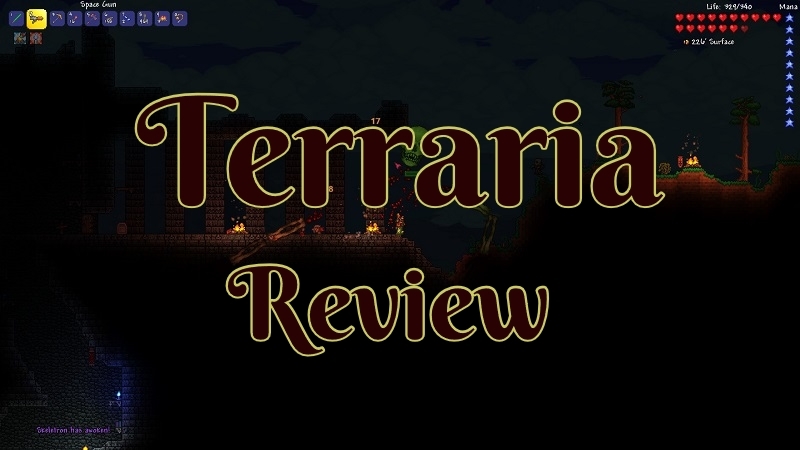 Terraria is quite the adventure to be had for a two-dimensional sandbox game. From its procedurally generated world to epic boss fights. It will catch you off guard and spoil that perfect plan. As someone who enjoys being a cave dweller in games and mining that ore. This game will have you busy for quite some time digging holes and exploring vast underground cave networks. Sometimes you are in search of new ores to continue upgrading and progressing in the game. Other times you are on the hunt for an adventure. There are a lot of cool things to find and explore like the Jungle biodome. Chests filled with goodies like weapons, money, and accessories in underground safe houses. Along with having a run in with death when you venture into an area you were not prepared to deal with it. The game also has two defined phases. 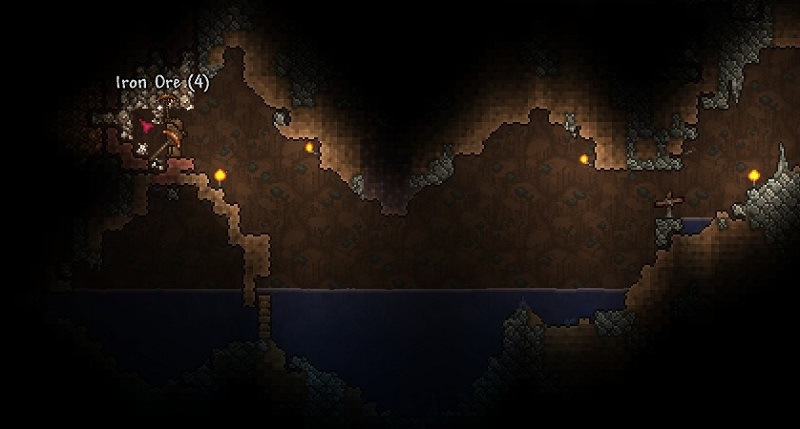 In pre-hard mode spelunking is quite an easy thing to do and the perfect time to set up tunnels and uncover a lot of ores like copper, silver, and gold. 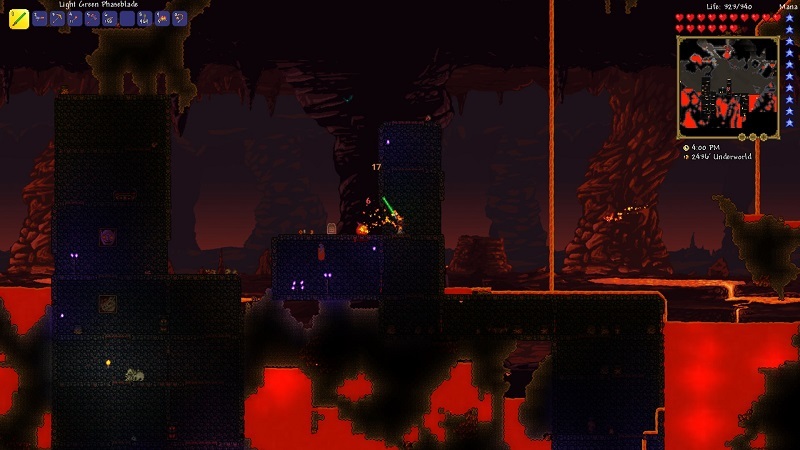 Then there is the hard mode that replaces easy monster and gives you the opportunity to spawn end game ores and bosses. Since I’ve played this game a few times I knew better than to try and rush to hard mode. There is just so much to do before going to that point. It is also very helpful to have large parts of the map uncovered and set up. While it is tempting to set up a large world just to go mining in it. I find for myself it really is not suitable for a solo player unless you want to sink over a hundred hours into it. I also find small worlds to be a little tiny. 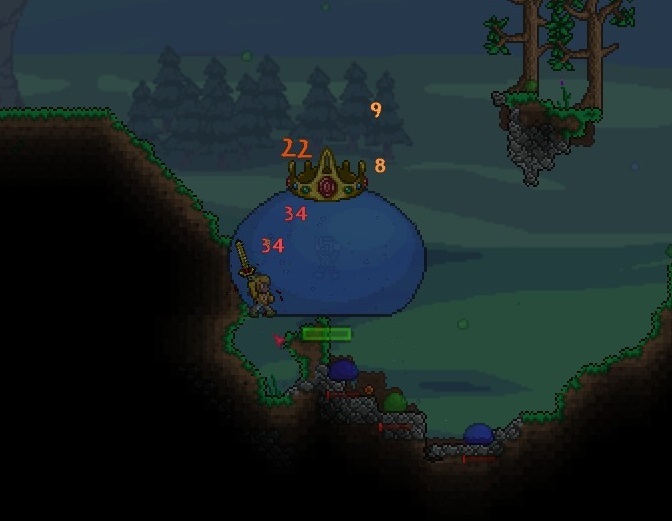 For whatever reason, you don’t always get all the items to spawn in. As such I enjoy medium in all of its glory. 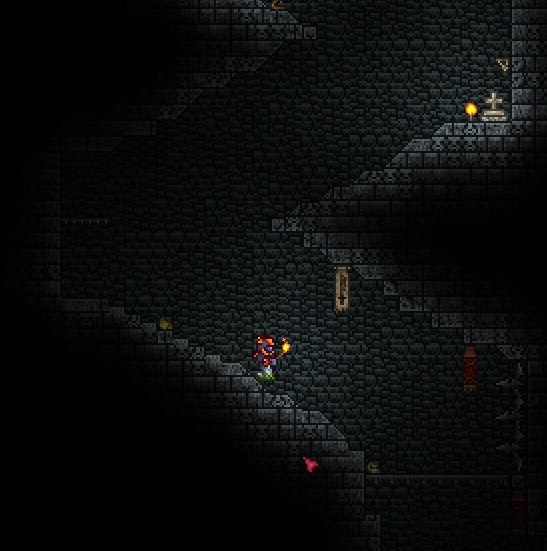 Especially for Spelunking as you get a good amount of depth at different challenging ranges. The great thing about this game is your character(s) and the worlds you create are separate. So if you wanted to go join a friends game you don’t have to start a new character. For the most part, they take whatever they had on them. This also means if you explored the daylights out of the single world the adventure does not have to stop there for that character. You can just create another world! Perhaps you will get different ore spawns and biodomes as well. Which in my eyes helps adds more replayability. Like any good spelunking adventure. You end up going down so far you are in the Underworld! 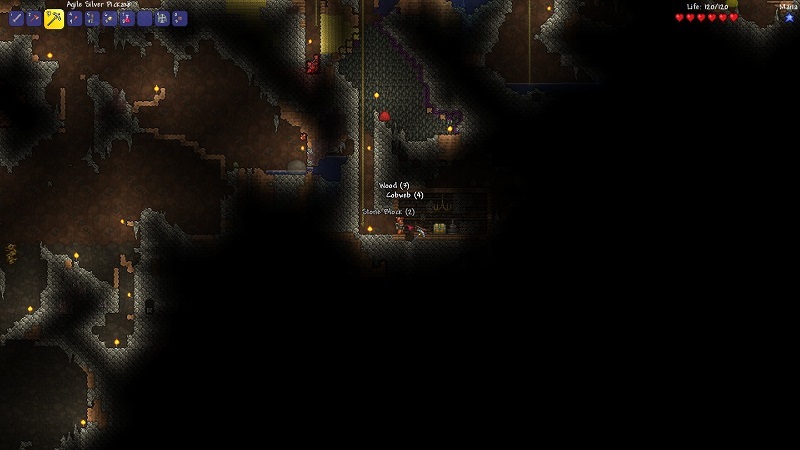 Oops, I’ve spent far too long down there before looting chests and setting up a battle arena. Hold on tight adventurer we want an escape with all our newly found spoils. It’s time to recall back home! If you are more of the peaceful building type of person this game has something to offer you as well. As you can tell I am not one of those people judging by this screenshot I took! You can spend a fair amount of time gathering different blocks and building materials to make one amazing looking house. Heck, you might even venture off to other realms to find what is not in your own to make it something extra special. As you can see I have a bunch of NPCs in their own rooms. The game has quite a number of NPCs and it is one of the reasons to set up a place other than having a chest and crafting area. You have everything from the starting Guide who will steal the first room that qualifies to more useful people showing up like Arms Dealer who sells weapons! You can even get some that have crafting stations that you can buy to expand what you can craft. There are certain requirements before they can even show up let alone move into an unused room. Many times that is focused around you defeating a boss or completing an achievement. Witch Doctor for instants won’t even show up until after the Queen Bee has been killed at least once. The NPCs require a light source, a table and something to sit on but they never take a rest. There is also some exact space requirements and you need to build a wall as well to keep out the elements. Thankfully the game has an in-game option to check if a room qualifies. I definitely did not build these rooms for optimizing space it was just the first design I set down that was good enough. Which is about as fancy as I get for building a house. The downside to my design choices is I get unwanted guests from time to time on my roof! Shoo king Slime you not welcome. Please take all of your slimy boss friends with you as well! This game is so chockfull of bosses you will find a few in pre-hard mode and skyscraper tall ones once progress towards hard mode is made. Many of them can be trigger by doing certain things while others are random events to catch you off guard and steal the coins out of your pocks! Oh, the places you will find bosses when you were just looking at the flowers trying catch butterflies. 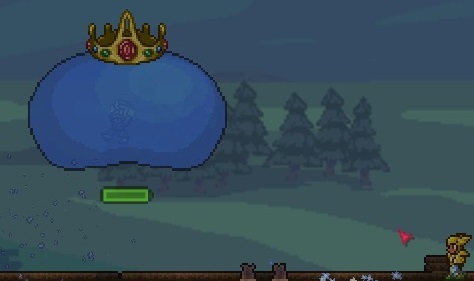 The Slime King naturally had to be pulled off the roof to my house. He later crushed my spine and escape. I’ll be putting up some wanted posters soon! How can I forget Eye of Cthulhu challenging me the moment I get above ground without me even having an arena set up. Sir/Madam/It, I will be back to get my revenge proper one day. 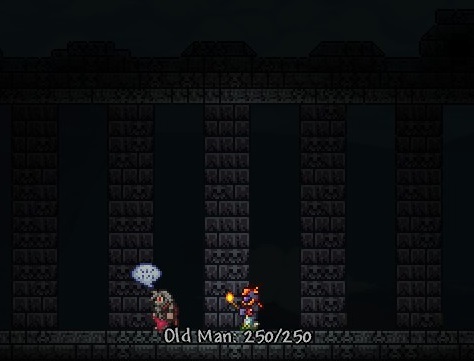 Then you have this creepy Old Man who won’t let you go down into his Dungeon until after you defeat him. He looks so harmless, right? He is something nightmares are made of. There are also other dungeons like areas you tend to find like the Temple. Many times it’s worth exploring underground you never know who or what you will find. If you can’t tell by now boss killing in this game is not something you do on a whim. You spend a fair amount of time setting up an area to do combat in. Just standing still will get you killed and even worse you would have hardly done anything. You also tend to spend time collecting gear and weapons. You might also collect a hand full of healing potions and other stuff like Ironskin potions for increased defense. 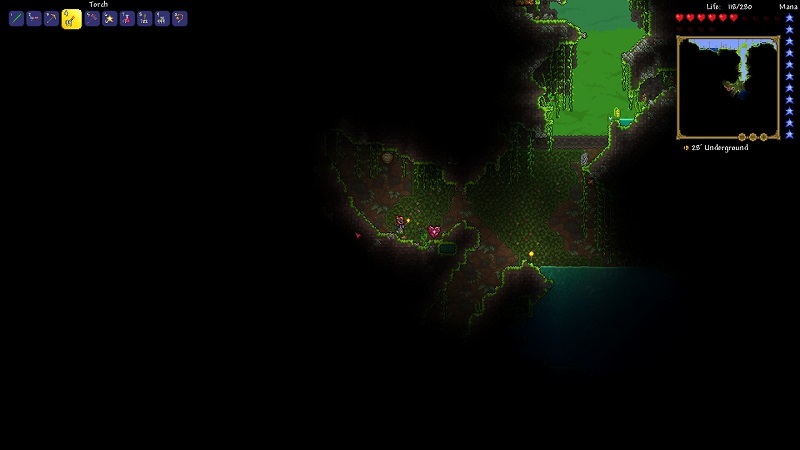 This is an area I had set up for doing battle with the Queen Bee. She lives underground in a hive and I was kind enough to replace the door once I had broken in. I also set up shop by placing platforms down for me to be able to move up or down in to avoid her attacks. I also placed a few campfires for some health regen and light as well. Fights tend to be a few minutes long in this game. The only thing that will get hit a few times and die is you so that is something to keep in mind. While bosses can be soloed I will say they are more fun in a group. Even more so when one member is moving out of the way and another is able to lay down full damage. It just makes things easier. It’s also great when you need to set up a super long platform for a battle. I don’t happen to have any saved files of a hard mode world anymore. I also don’t feel like spending a chunk of my weekend building a 1k-2k long platform and cleansing out the underworld of the building, fighting endless waves of monsters and getting killed a bunch. Along with getting some needed upgrades. This would also take my world into hard mode and I have no desire to rush. Otherwise, you will have zero fun when you were not yet ready for it and die at every corner and hole in the ground. 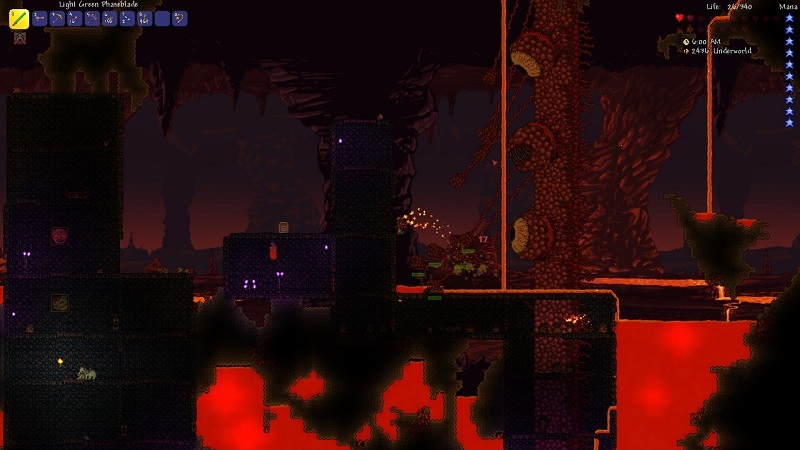 It was, however, funny to trigger the Wall of Flesh and get murder to grab a quick screenshot! Perhaps another weekend I’ll gear up some people and take a ran at him for old time sake. The game has a bunch of non-boss events that happen as well. Things like getting raided or having a meteoroid crash land on a random part of your map. While some of them you can try and trigger yourself. Other times you could be on your way to get back to a location after getting killed and suddenly your plans have been altered due to something going on. Here are a couple of examples below. I remember in my early days in-game once my life bar got over a certain amount a goblin army decided to attack my house and NPCs. That night was filled with horrors of getting killed over and over again as I was ill-prepared to deal with such a thing. I guess my NPCs were used to it by now as they pitch in fighting off the attack. Anytime a goblin went inside to their rooms they lobbed volleys of death. Did not matter if they teleported in or got in from an open door. They help break up some of the massive amounts of goblins I was facing. As the horde of goblins swarmed I swung my sword hoping to kill off a few before getting killed. They would keep coming in wave after wave. So I would keep respawning for another beating in hopes of getting the event bar to 100% and seeing the last of them disappears. The ground was covered in coins and items from the fallen by the time it was all over. 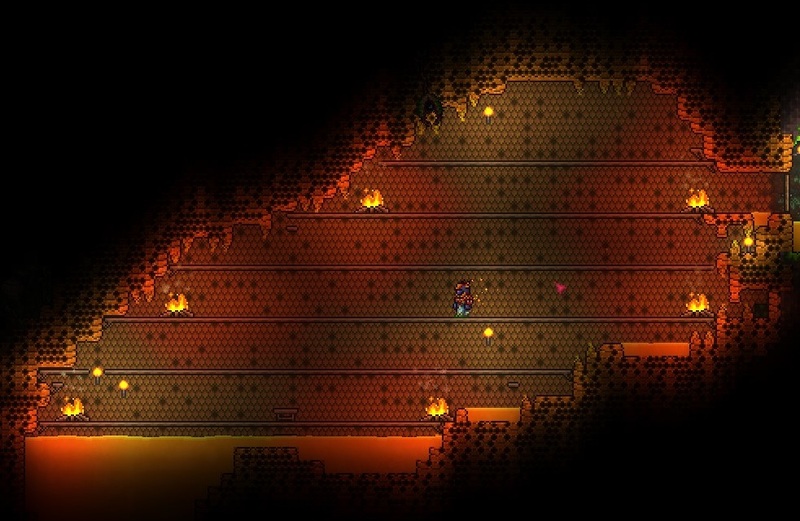 I made some gold that night and had more fun than working on an elevator I was building to the Underworld. 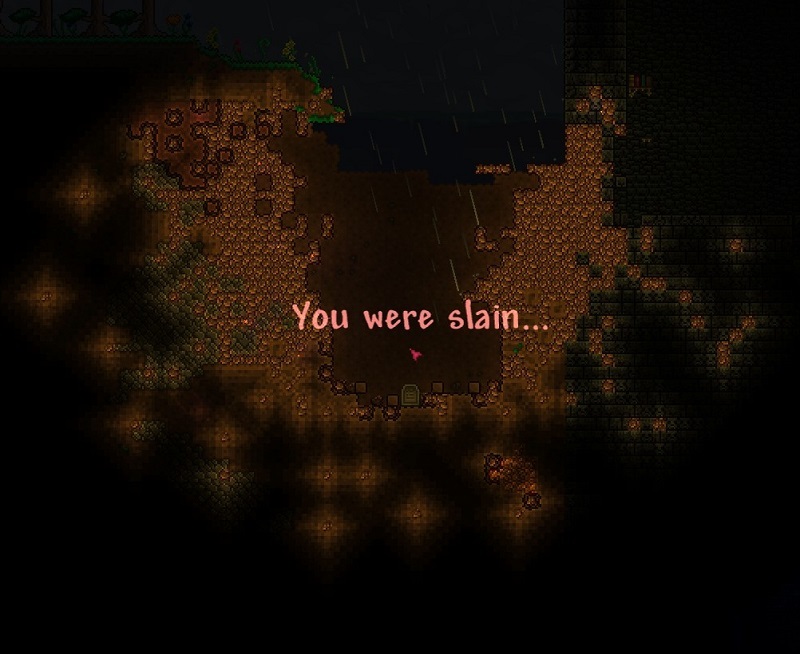 This is quite a fun one that I happened to be unlucky with it spawning super far away from my house and right behind The Dungeon. 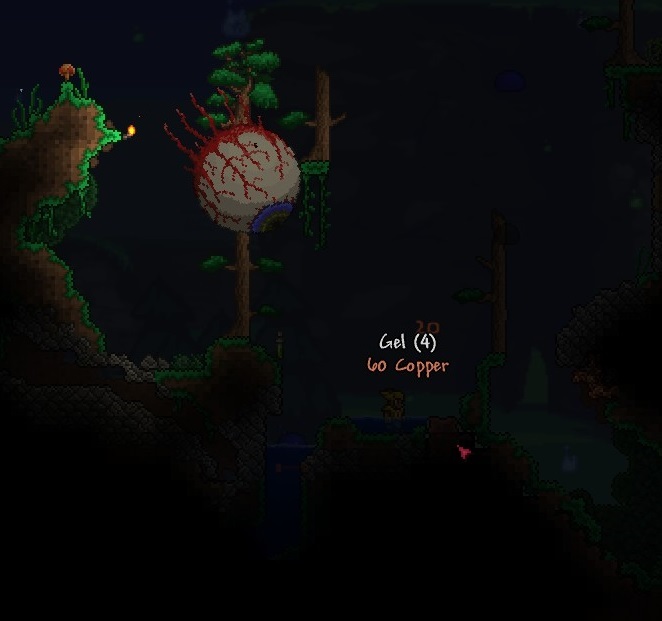 After you trigger this event a meteorite has a chance to crash land leaving you a deposit of ore to mine for new upgrades. As you can see from the screenshot when I jumped over the dungeon building I missed the other side and dropped some bombs to take out some of the ore. If you thought it was just as simple as going over and mining the stuff you don’t know the joy of this game yet! This stuff will burn you if you step on it. It also spawns in flying Meteor Heads when you get close to the crash site and they hurt! I made myself a Space Gun and some other upgrades after clearing out most of the ore. It is in a rather tricky spot and at the time I did not have pickaxe that could break the Dungeon’s walls which would make it easier to farm. You also have random weather events such as a snow or sand storm in their representing biodomes. They can reduce visibility to near zero, have high winds making it hard to walk and spawn in monsters to deal with. If you ever thought you were going get somewhere quick in this game it has something else in mind. Unless you build a giant sideways shaft going from one side of the map to the other. Then you can just create tunnels out like a mole rat. The downside is that takes a lot of time and since I was just playing solo this time around I decided against it. As such I get to enjoy the weather and whatever random events I run into! This is one of those games over the years that I’ve played quite a few times. To the point, I have over 200 hours played now and it joins a special group of games that surpass that 100-hour mark played. I’m still adding to the hours played as it’s still a fun time. There are quite a lot of other things in this game as well. 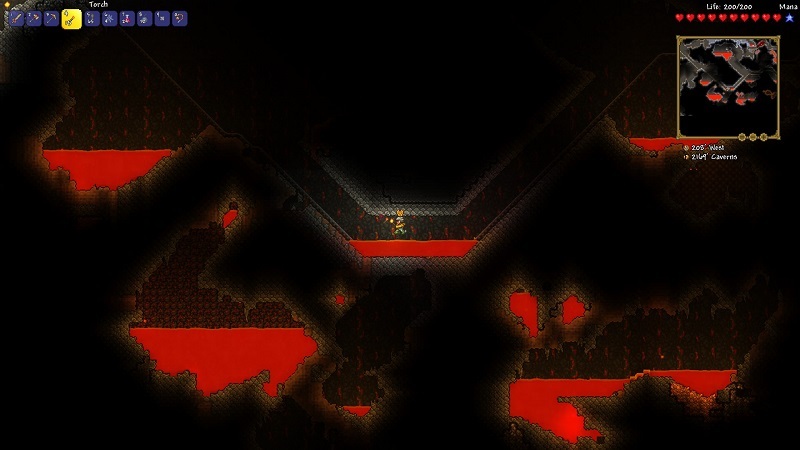 Like corruption or Crimson biomes which can take over your realm. Crafting which I only touch on a tad that fuels your endless desire to keep getting new materials to make item sets. Along with almost thirty boss fights that more than most games have. 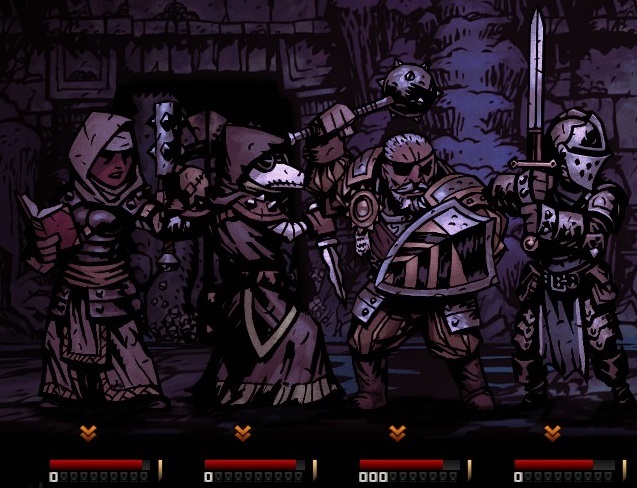 I take a look at Darkest Dungeon from making a party and the adventures you will go on with your heroes. Along with buildings and so much more that makes it a rather fun and unique dungeon crawler game.